business time. | there's no place like gnome. I found this on a blog via pinterest a few days ago. I’m an adult now; I have real business cards. [as opposed to fake ones. I’ve had those too.] I needed something to carry them about. I have some in my wallet; some in my desk drawer. But I don’t always have my wallet and I’m not always in my office. 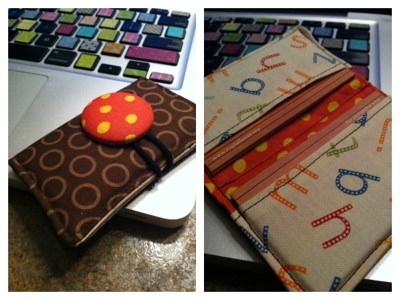 A business card holder I can sew? Like any project of mine, it’s a bit wonky. And not quite right. And made with random scraps of fabric I had on hand. And I’m a little unsure of the HUGE fabric covered button on the front. But it’s what we got and I’ll use it and love it and hand out my business cards every chance I get. It’s practical if nothing else. hey. like my keyboard? thank you boredom, pinterest, and my happy tape supply. hey again. title reference? here.